Mensah Beckons For Big Sam | The Transfer Tavern | Where football transfer rumours fly or die! Reports in England suggest that West Ham are looking to complete a deal for defender John Mensah after he impressed during a trial spell with the Upton Park outfit. The former Sunderland player looks to be the man Sam Allardyce has chosen to bolster his defensive options after he ran the rule over a trio of trialists to East London last week. The Ghanaian was joined by Anthony Vanden Borre and ex-Manchester United man Mikael Silvestre in training with the Hammers, but it seems that Mensah, who was released by Lyon in the summer, is the man whom Allardyce wants to bring in. The 29-year old would probably not be first choice for the newly promoted side, but with limited cover at the back the former Bolton boss is looking for someone who could provide experience from the substitutes bench. Mensah has been injury-hit over the last few years, with Steve Bruce citing that as a reason as to why he didn’t try and sign the ex-Rennes man permanently, but Allardyce has obviously seen something that interests him. Winston Reid and James Collins have started the season well at the heart of the Irons’ defence, helping them keep two clean sheets at home with the New Zealander also contributing a goal against Fulham before the international break. Team GB defender James Tomkins is the main competition and a number of fans have called for his inclusion despite the good start to the season, but it seems that Mensah is going to add further depth to the weakest area of a team who are known for their attacking stars. 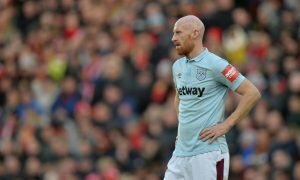 With the season now over a month old you would think that Mensah’s wage demands may have lowered, but with the captures of Andy Carroll and Matt Jarvis it doesn’t seem that money is a problem for David Gold and David Sullivan and that the 6″ defender will be on his way to the capital.